I mentioned earlier that I have been plunked down in the book of James - the Bible. I wanted to define 'plunked down', with a little story. The six year old girl wore an old fashioned, knit dress, all baggy and plain. She had on knee socks and tennis shoes. The only item of clothing that gave her security about the rest, was her favorite orangey, brown, button down cardigan with the tie belt. Her round face beamed with the wonder of school while her chunky braids pinched tight and uncomfortable against her ears. She sat in the front row of chairs in the damp, gloomy basement. The whole school was in the basement this morning for what was called "joint devotions". It was fun when they all got together like this. They had a special bible story usually and special singing. April gave me these red knobs a couple years ago. 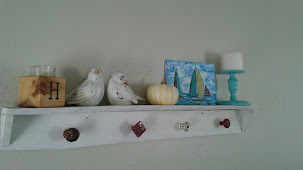 My son made this rough pine shelf/hook,which he feels I ruined by painting white. I need white right now. My son will be fine. The red knobs like being here. I have decided for them since they are unable. I didn't ask permission to take orders here, but if you want one of these beauties, email me and I'll give you Jay and April's email address. It's been a long one. It would've felt normal if I did. I was awaken by Shaunti leaning over me on the couch whispering "Mom" about one foot from my face. My heart was thumping instantly with the dreaded thought, "Who threw up now?" We've been sick in this house almost three weeks running, things are beginning to gel up there in my head. She only wanted to know if she could wake up. Where does this child get the urge to be wakeful? After the morning rush of getting lunches packed, husband leaving for work at the Post Office, and taking the kids to school, I headed to the Bread Basket to meet the food committee ladies for the planning of an upcoming event, only to discover I left "the notebook" at home. That was fine. Just a couple more minutes on the road, down the hill and back up. I have coffee, all is well. Was it David who said, "My soul is overwhelmed within me?" I love how real David was. He said all that was on his heart to God and we get to read it. I'm pretty sure he didn't edit what he wrote. It sounds like he had to get it off his chest and so he wrote it down as it came forth. He didn't stress about sounding good or politically correct. He didn't worry how the reader might take such heart felt drivel. His concern was more about staying current with God, not whether or not his words would look good on paper or be read a hundred years from when he wrote them. And then once and in awhile he wrote things so deep, it becomes a moment of worship when the reader comes across it at just the right moment in his/her life. He understood how human we really are and how prone we are to dwell on our own problems and miss the big picture. He wrote this too. We had a wedding anniversary yesterday. I always think we should go all out for an anniversary. I've felt desperate about it at times trying to make "our day" special smacked right in there with Valentine's Day. Over the years I've found that all the special flowers, chocolates, and sweet words are not what make "our day" a good one. And that it can be a good one without all the fanfare. I know. I am becoming boring and just like I said I would never be. I vowed to myself when I first fell in love with this man that I would seek to make everyday filled with warm and fuzzy moments. OK maybe it wasn't quite that strong, but I was not going to be one of those boring couples who never did anything. Do you remember what it was like when you were little, the anticipation of fun? When I was quite young, I would look at the adults in my life and couldn't wait to have the freedom and excitement they had. I'd think lofty thoughts such as: 'Oh, to be a grownup with no one telling me what to do or where to go or when to come home at night'. When I was in school, I used to dream of the day when there would be no more tests, scholastically speaking. Boy, was I wrong. I remember thinking how uninformed adults were in saying they had difficult things. They made life look so good. And easy. And then they would say things like, "If you think you have it bad now, just wait till you're an adult. Then you'll know what real trouble is." Snoopy isn't very photogenic. Shaunti attempts to make him so. This is when I try to smooth her hair and make her look a little more presentable and she says, "It's OK mom, I like my hair messy like this," and she then proceeds to swipe her hand the opposite direction of smooth. They redid the road and the walkway this past summer. Did I mention? Its a fun walk. Looking at Main Street. It's pretty quiet on Sunday afternoon. We watched three different trains on this particular walk. At the corner by our house... Snoopy is looking at yonder dog. It seems to come to this every winter, the long nights of coughing, moving to the couch, and now, since moving to this old house in town, the scritch scratch of mice keeping a person awake, alert, and unenthusiastic. This is where I found myself Saturday night. A two o'clock trip to the bathroom with uncontrollable coughing which triggered other unwelcome sickness, AKA, coughing yourself sick, literally, is one way to distract a body from thinking about vermin running loose in your house. You're welcome. I'm sure you wanted to hear about that. But it all comes back when upon cleaning the kitchen counters after the family has gone to church on Sunday morning, you discover perfect little paw prints atop the mug of bacon grease you lazily failed to put away. That, and the reoccurring visits you heard from the couch the following two nights. The little girl is still in need of encouragement even tho she lingers on the edge of becoming a lady. When no ones looking, the mom watches her little girl unawares. The mom is blown away by her little girl's freedom to be when no one watches. She sits on the rock ledge surrounding the flower garden. Everything is brown and muddy with patches of snow. Still, the little girl finds two rocks, pine cones, and sticks with which to create. As she grinds garden flour by crushing everything into a powdered mess on the large, flat rocks, she sings opera style of birds and trees and mountains. Her gaze of contentment is evident as she turns her face into the murky sunshine that is trying to break through the sky above. She comes in once, to change out of her flimsy slip on shoes for something a little warmer. She chooses lace up boots that are equally as thin as her shoes. Should the mom tell her this disheartening news?